Washed ashore from Germany after high school in the summer of 1986, and working as an au pair in Chilmark, I loved having unexpectedly landed on such a beautiful island. Little did I know then, I would eventually call Martha’s Vineyard my home of 30 years and counting. I have always loved textiles and color, and my training in design and fine sewing in Germany in my early twenties enabled me to return to the island and work for several local designers in the early 1990s, most notable Michèle Ratté velvets. On a leisurely trip to Brimfield Antique Show in 1996, I discovered an entire table stacked with 1940s barkcloth curtains and enthusiastically purchased a few pieces. Upon my return to the island I created a few bags, which were immediately snapped up by several boutiques, on and off the island. I noticed the appeal that this fabric had and that women everywhere were drawn to it, appreciating the unique texture and mid-century design sensibility. Over the years I have shown at many high-end Craft and Artisan Shows all over the Northeast, and since 2011 my work has been featured in the only local artisan co-op on Martha’s Vineyard, the Night Heron Gallery in Vineyard Haven. I have introduced different bag styles every year, and I take pride in creating each bag individually with the help of my two assistants, Shirley and Elizabeth. I am very grateful to all my lovely customers who have purchased bag after bag and encouraged and supported me. 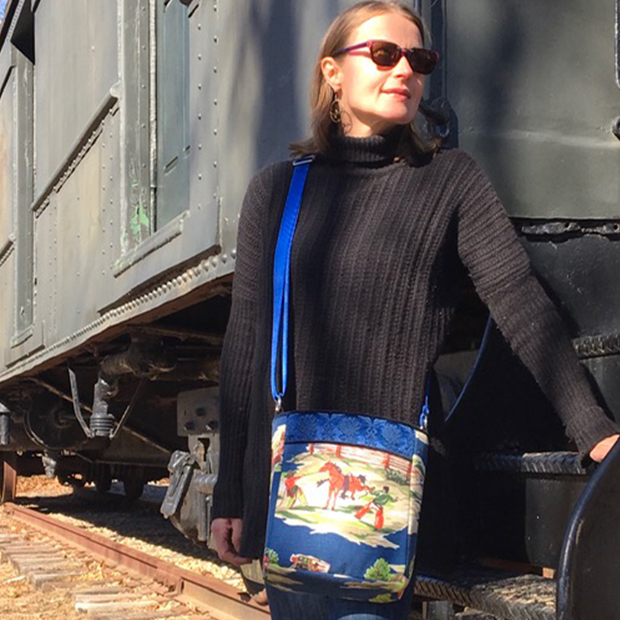 I often hear stories of women receiving compliments or bonding over their SylvieBags in different places all over the country. Mid-century barkcloth is becoming so rare now, and I am realizing that one day I will be no longer be able to create bags and pillows out of this wonderful material, making each bag even more special. On a personal note, I live with my husband, daughter, dog, two cats, and bearded dragon (lizard!) in West Tisbury. We respect your privacy and would never sell your details or send you email pollution! Thank you for signing up to SylvieBags!